Enviro’s design of a pyrolysis plant with a capacity of 30,000 tons tyres/year and 9,000 tons of recovered Carbon Black. Enviro has a broad base of ongoing sales processes regarding the establishment of recycling plants with actors around the world. The company has several quotation processes and four parties have signed MoU’s or Hoa’s. – We’ve never had this many active quotation and sales processes at once before. This is due to new legislation regarding producer responsibility, increased demand for carbon black combined with a lack of virgin carbon black, and of course our sales efforts, says Thomas Sörensson, CEO Enviro. Enviro’s dialogues regarding recycling plants are with parties in Denmark and the United States, among others. Other quotations are discussed with actors from countries such as Mexico, Chile, China and Abu Dhabi. – In the spring, we had several visits from actors from China, which – as we assess it – are serious. The most interesting actor has invested in and established European recycling and water purification technologies in the Sichuan province since a few years back and is financially strong. 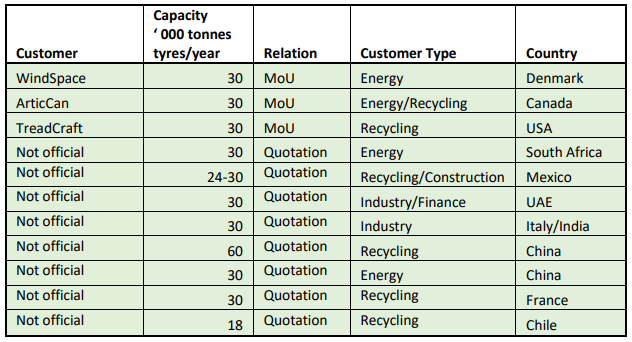 They have the landed and an agreement with the authorities to recycle great volumes of tyres over time. – The visit from a Mexican delegation this spring resulted in updated quotation documentation. They will continue their internal decision processes in the late summer and establish more contacts with the authorities in the region and with potential customers for the material. In the next couple of weeks, Enviro’s plant in Åsensbruk will be visited by delegations from Russia, USA, England and Sri Lanka. The global interest in Enviro’s recycling plants and pyrolysis technology is growing. Apart from the ongoing sales processes, new requests come in continuously. – Each week we receive numerous contacts related to plants and we are prioritising those contacts so as not to waste valuable time on less promising prospects.